If you have a torn or otherwise damaged garment, or if you would like to make some clothing or a costume, it's incredible useful to have a sewing machine. Another invaluable tool to have in your arsenal is a serger. Both are used for sewing, but they serve different functions. In this article, we'll take a look at how sewing machines have evolved and at the role the serger plays in sewing overall. We'll compare serger vs sewing machine, looking at the pros and cons of both. Finally, we'll help you decide whether you should invest in a serger or if a sewing machine alone will meet your needs. Serger vs Sewing Machine: How Are They Different? How Does a Serger Work? What Are the Top Sergers? 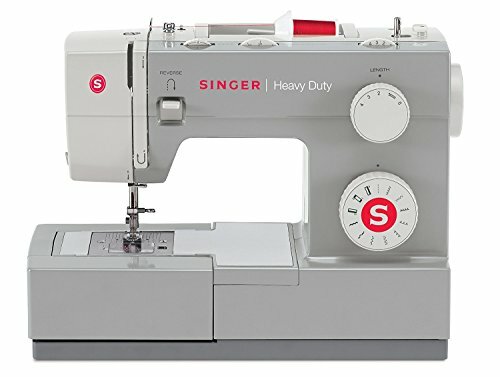 What Are the Top Sewing Machines? In the year 1755, Charles Fredrick Wiesenthal invented the first mechanical device intended to "aid in the art of sewing." It was simple, but it was the first step in mechanizing the sewing process. Until 1755, all sewing was done by hand. Garments had to be meticulously cut from fabric, put together in the right pattern, and then sewn together using a single needle and thread. Because of this, sewing was time-consuming, tedious, and could be very hard on the fingers. Seamstresses used thimbles to protect their fingers from constant needle pricks, but they still suffered from cramping and calluses over time. Hand-sewing also severely limited the amount of clothing that could be produced. It would take hours to produce a single dress or a pair of pants. Leather items like saddles and bridles, and heavy canvas goods like ship sails, were also sewn by hand. The invention of the sewing machine revolutionized all of these industries. From 1790 to 1829, several kinds of sewing apparatuses were invented with varying degrees of success. However, in 1829, Barthelemy Thimonnier invented the first widely used sewing machine. He was issued a patent in 1830 and started the first company that mass-produced army uniforms. Over the next 15 years, various inventors would come up with different elements that make up the modern-day, American lockstitch sewing machine we have today. None of these inventors patented their work, so the first person to put all the elements together into one machine was John Fisher. However, two other inventors, Elias Howe and Isaac Merritt Singer put together very similar machines at nearly the same time. As often happens in history, a messy battle over patents ensued. Although Howe actually won the legal battle, resulting in Singer having to pay a hefty sum for the use of patented parts and technology, it is Singer whose name we remember. The next several years of sewing machine history saw different inventors trying to add or change things to improve upon the original design. Each person tried to patent his contribution, and lawsuits over who was the original inventor of what piled up. This culminated in the Sewing Machine Wars. 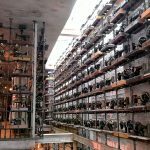 So many people were making contributions to the invention that it was nearly impossible to sort out who had invented what part of the machine first. Realizing they were getting nowhere by working against each other, the key players called a truce and formed something called the Sewing Machine Combination. Together, they issued licenses for sewing machine production until the patent expired. Since that time, the sewing machine has been changed and improved upon many times over. Tweaks were made to the positions of the needle, the method of feeding the fabric and thread, and the type of stitches used until the most efficient machine was achieved. The invention of the sewing machine took the production of clothing out of the hands of housewives and turned in into an entire industry. Millions of jobs were created by the new clothing industry. Now, almost two centuries after the first sewing machine was conceptualized, we've come full circle. The modern sewing machine, as well as the serger, have allowed sewing to come back into the home. Anyone with a little time on their hands can learn to sew and make professional-quality items. Having both a sewing machine and a serger can you help you in that process. The history of the serger parallels the history of the sewing machine. Like any of the many changes to the sewing machine, it was created to fill a need. Serging, or overlock stitching the edges of seams and hems, is a way to create a neater, stronger, more flexible finish than can be achieved with a sewing machine alone. A traditional sewing machine uses a loop stitch to sew pieces of fabric together. It has one needle with an eye in the end where thread is run through. Traditional sewing machines use one roll of thread and one needle, with the exception of some models that are capable of two-needle sewing. In order to form the loop stitch, a bobbin is housed underneath the presser foot and plate. The whole machine is controlled by an electric motor that is run by a foot pedal. Most modern-day sewing machines have 20 or more different possible stitches, as well as the ability to adjust the stitch length and the thread tension. All of these features make the sewing machine very versatile. However, the serger picks up where the sewing machine leaves off. In the end, the decision to purchase a serger vs sewing machine is a personal choice. In a lot of ways, it comes down preference. Some people prefer the look of a serged seam over that of a straight-stitched seam. Sergers provide durability but require you to switch and use another machine in the middle of a project. After you've put a lot of time and energy into learning to use all the features on your sewing machine, you will have to spend more time learning how to use your serger. Not only will you have to learn how to sew with a serger, but you must learn how to change the thread cones and how to thread the needles and bobbins. 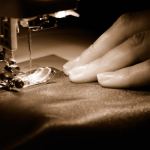 Just like with a sewing machine, a serger will need regular care and maintenance. However, once you've learned how to use your serger, you can create beautiful, trimmed seams that will stretch with the garment rather than snap and break. Your garments will have a level of durability that you couldn't achieve from just a sewing machine. You will find that most professionally sewn clothing is serged along the seams, even if those seams are then hidden from view. Gathering and lettuce edges are much easier with a serger as well. If you are a professional seamstress with a home-based business, you will definitely need a serger. In order to produce quality, long-lasting garments, you will need the features that a serger provides. As a professional, you should be able to master the new machine in a few weeks and be on your way to creating more inventory. In order to achieve the best possible product, you should invest in a serger. However, if you are someone who occasionally sews for pleasure, you probably don't need a serger. It's possible to achieve most of the effects that a serger offers using your regular sewing machine. A sewing machine can do an over the edge lockstitch if needed. It also offers many other stitch types and strengths to compensate for not having the multi-thread lockstitch. Not having another machine means less running around and less changing thread and bobbins. Overall, the standard home seamstress doesn't need a serger. However, if you would like one for the convenience, it will certainly get used. We considered several of the top brands and compared price and features to offer this list of the best sergers on the market right now. Consider your own personal sewing needs when choosing which serger to purchase. 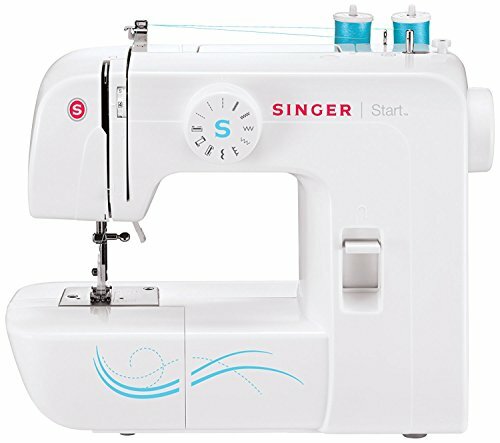 We compared many top brands, comparing price and features to create this list of sewing machines. Choose the best machine for your budget from this list by considering your budget and what features you need in a sewing machine. Sergers can be found for anywhere from $200 to $600 dollars on Amazon and at major retailers. Less expensive sergers have fewer cones of thread and are not as fast. Higher priced models offer more cones of thread as well as additional attachments and features. Price points on sergers generally have more to do with durability and amount of cones of thread than different features offered, since sergers all essentially perform the same function. Serging seams is not as varied as sewing, therefore Sergers are an add-on piece of equipment to what you have. Take this into consideration when you are considering a serger vs sewing machine. Sewing machines can be found for anywhere from $80 to over $600 on Amazon and at major retailers. There is a wide range of price points in this category. Basic sewing machines offer just a few types of stitches and may not do well with a wide variety of fabrics, whereas more expensive models offer many different stitches and lots of fabric options. Sewing machines can also be optimized for certain things like quilting or working with heavy-duty types of material such as leather or canvas. When considering what price point is right for you, take into consideration all the projects you might take on now and in the future. Making a major purchase such as a serger is not a decision to make quickly. It's important to consider all the reasons for using a serger vs sewing machine, and then weigh that against the money you will spend on a new machine. If you have been using a sewing machine for some time and are looking to expand your sewing options, then a serger might be the right option for you. A serger is meant to be used in addition to your standard sewing machine unless you are sewing exclusively seams and hems. In most cases, you will need to start with a standard sewing machine, learn the basics and work your way up to the advanced features. Once you've exhausted the possibilities on your standard machine, it's time to move up to a serger. Once you take the time to learn how to use your new machine, you'll find that a serger works much more quickly and creates stronger stitches than your regular sewing machine. It will take your sewing projects up a level, making everything look and feel more professional. Your garments will stretch without threads snapping and your seams will be less bulky. Overall, a serger is a worthwhile investment for the intermediate to advanced seamstress who wants to take their work up a notch. Adding a serger to your sewing room will make your work better and push you to be a better seamstress. There is a learning curve, but the time and investment will return to you in better quality work and, hopefully, more projects for your portfolio. In the serger vs sewing machine debate, neither wins. You should have both. 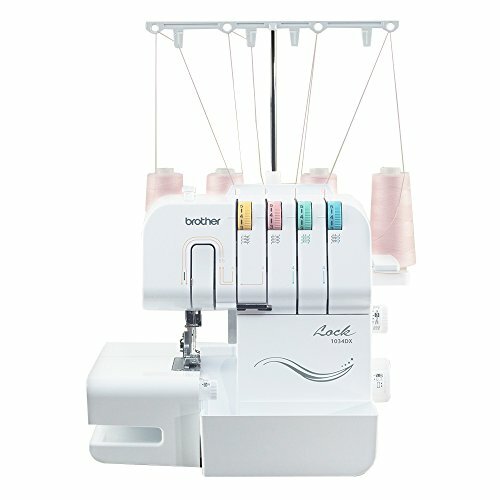 Previous articleIs The Brother CS6000I Your Next All-Purpose Sewing Machine? Next articleBrother HC1850: Is It the Best Quilting Sewing Machine Available?